Interior painting is begun immediately after trim work is complete. Depending on the size of the house and the complexity of the trim carpentry and exterior work, an entire paint job can take anywhere from a few days to a few weeks. 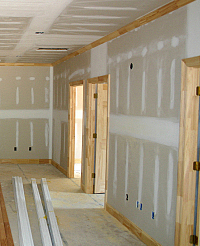 Painting labor is an aspect of building a house that you can do yourself if you want to save even more money. Where I build, you don’t need a license if you want to be your own painter, and that’s probably true everywhere. There is a lot more to it than painting, however, and you should know everything that’s involved. ● Paint and caulk all exterior surfaces which require it ─ wood windows, doors, cornice, siding. ● Caulk windows and door frames. 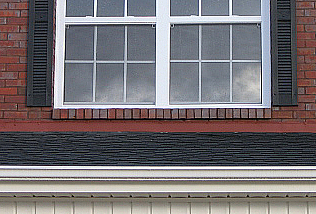 ● Paint and caulk exposed flashing to match color of brick or siding. ● Interior trim materials often have rough edges ─ sand and putty as needed.